We realize that businesses have different needs when it comes to attendance. 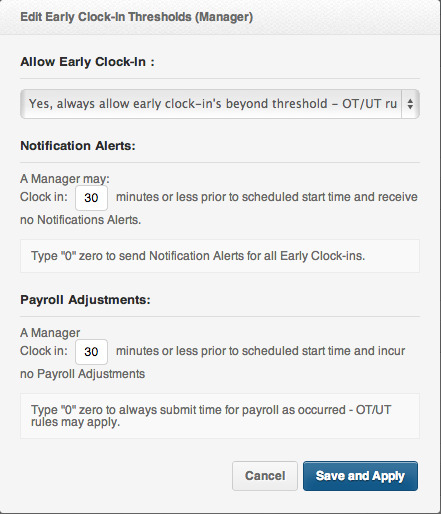 By using the Thresholds feature in PayrollHero, you can set automatic limits when it comes to the punctuality of your employees. If store clerks clock in early by 30 minutes or less, for example, you can set those clock-ins to always revert to schedule, cutting out significant effort from resolving attendance every pay period. This feature is customizable by employee type. You can select by individual job rank, such as allow someone more senior to work overtime with no problems, but get alerted for someone less senior working unauthorized additional hours.